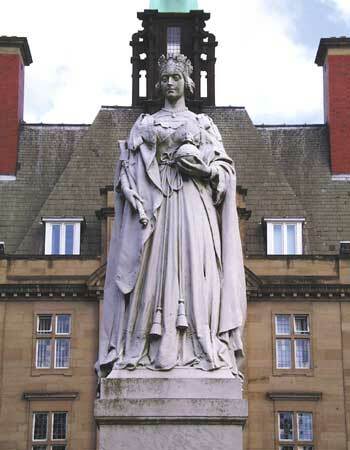 The statue of Queen Victoria, Royal Victoria Infirmary, Newcastle. Location: Lawn to the front of the RVI. Materials: White Marble and Sandstone. Status: Listed Grade II*. To commemorate the Diamond Jubilee of Queen Victoria in 1897 it was decided to raise funds to construct a new hospital for Newcastle. The Corporation and Freemen provided a site of ten acres on the Castle Leazes and £300,000 was raised towards the construction of the hospital which began in 1900. At the opening of the Royal Victoria Infirmary King Edward VII also unveiled the statue of the young Queen gifted to the hospital by Sir Riley Lord. A gilt bronze maquette was also donated to the Hospital. The statue is the work of Sir George James Frampton R.A. (1860 - 1928) and portrays he young Queen standing in robes with orb, sceptre and crown. The over-life-size white marble statue stands upon a high square pedestal - also of white marble - with four low square buttresses at the corners. Side panels with curved heads bear the inscriptions "Victoria Queen - Empress 1837 - 1901 : Unveiled by King Edward VII July 11, 1906 : The Gift of Sir Riley Lord 1906". The statue and pedestal, 22 foot in height, stand on a paved square sandstone terrace with indented corners and steps surrounded by dwarf walls.